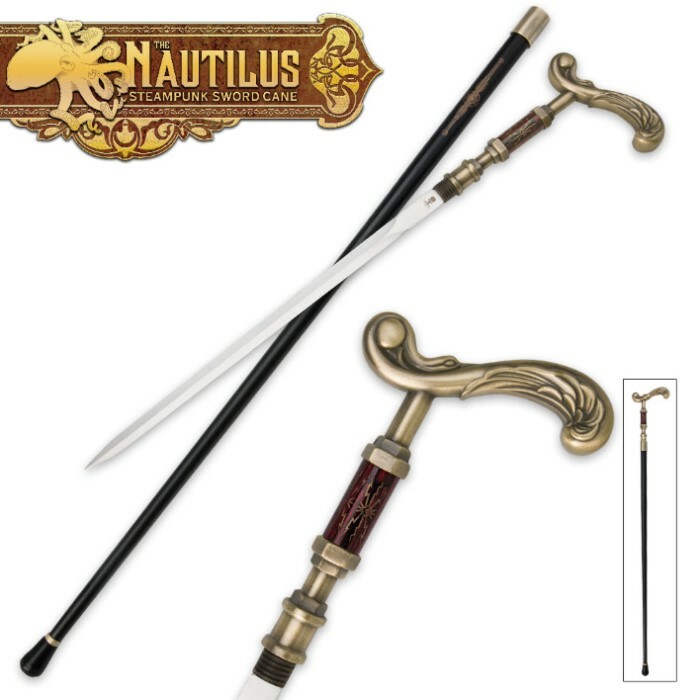 The Nautilus Steampunk Sword Cane | BUDK.com - Knives & Swords At The Lowest Prices! Named after Captain Nemo's famous submarine, The Nautilus Steampunk Sword Cane will be your steady companion on all of your adventures while adding custom class to your wardrobe as you travel. Secretly hidden away in the shaft is a 12" stainless steel blade that can repel any vicious attack on land or sea. The Nautilus has a very comfortable metal and wood handle that will enable you to stroll or defend yourself with ease. In addition is the rigid metal shaft with a durable rubber end cap designed for years of use. The entire cane is 43 1/2" in length. I’m not going to be too negative on this considering the price. If you are looking for a functional & useable sword cane this is not the one for you. It does look good, I will give it that. Nice finish work but the fitment leave a lot to be desired. If you are just looking for a cool looking LONG cane to carry around while you are doing steampunk cosplay... this is great for that. It looks good. First, make sure you know your height. I removed 7 inches from the cane. It is advertised as a cosplay cane. It will bear weight. I am 5FT 10IN and weigh a little over 200 pounds. The cane will stand up to hold my weight. All that said, It is a really nice cane. A steal for what the price is. I recommend this cane. Good sturdy cane, heavy head, looks good, feels good but made for someone approximately 6 1/2 feet tall. I am nearly 6 ft tall and am going to have to trim about 3 inches off to be proper height. Too use a as fast defense weapon, forget unscrewing the sword in time, but enough weight to it to make an effective club. This can only be used as a can in my eyes. It takes a ridiculous amount of time to get the blade out, so using this in a self defense is very unlikely. The cane part is nice but the blade is dull and useless. This is clearly a display piece although the cane part is functional. If you want a steampunk cane this is for you. For the price, its an amazing sword cane!! Very sturdy, well built and has a good weight too it! I'm a huge fan of anything steampunk related so I had to purchase it. It is pretty large though, but that can be fixed by cutting a little off. Other then that, I am very satisfied with this purchase and would 100% recommend too anyone!! It is HUGE. Perhaps as a fantasy cane should be. Using the "half your height" rule for canes, at 42 inches, this cane is perfect for someone about 7 feet tall! Someone under 5 feet tall could actually use it as a walking staff instead of a cane. It arrived from Bud K in a huge box about the size of a coffin. The postage must have cost Bud K a fortune (I got lucky with free shipping) I like the wonderful mix of heavy swirling metal and the charmingly painted and stained small rosewood cylinder in the handle. 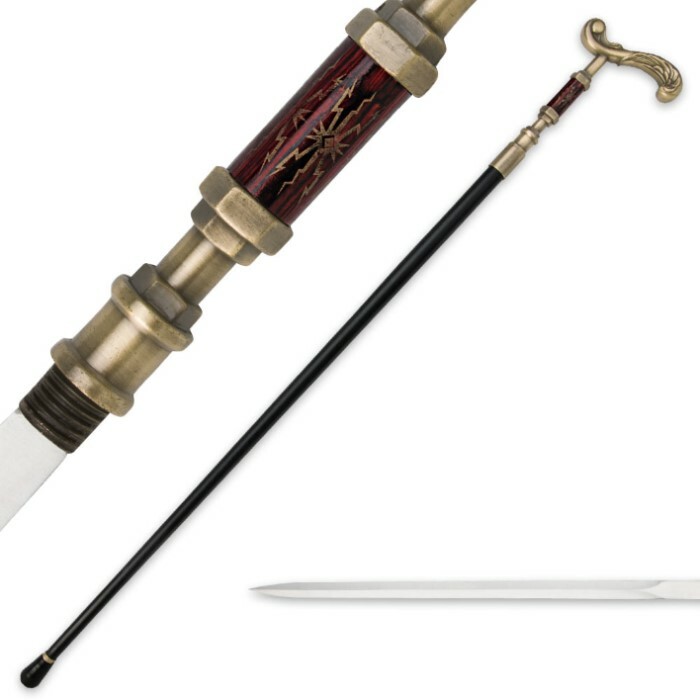 The sword inside is rather dinky and takes 6 full turns to remove, so would likely be useless in an emergency, but it is still a most remarkable cane, and the hidden blade adds much to its strange charm. I may never take it out of the house unless I get invited to just a costume party, but I really do like this one, especially for the price. It is just too wierd! Did Captain Nemo actually carry a cane like this? I will have to watch the movie again and see. Response: We would like to apologize for this inconvenience. We have taken a look at our stock and don't see anymore that are defective. If you would like a replacement sword cane or a refund you can contact our customer service department at 866-246-7164 and we can get that taken care of for you. Once again we do apologize for any inconvenience this may have caused. I just got this cane and when I open the box it was wow this a real nice cane it's longer than most canes the brass handle is really nice of course its not sharp but for the price what did you expect, Yes you should buy one for yourself. This cane makes almost all my other canes look cheap.